As we all know, the decision to go solar isn't necessarily an easy one to make. How much will it cost? Is my roof a good fit? How much will it offset my energy bill? What's the deal with net metering? If you've been wondering about some of these questions, we've got the answers! 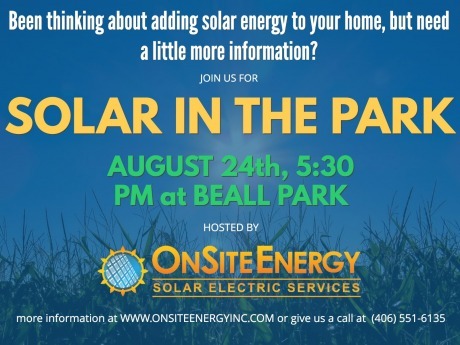 Please join us for Solar in the Park, August 24th 5:30-7:30 at Beall Park, where we will present on residential solar in Montana, answer your questions, and do a tour of some of our previous residential installations in the neighborhood. This event is free, open to the public, and kid-friendly with the Beall Park playgrounds right near by. Light refreshments will be served. EVENT SPECIAL OFFER: OnSite Energy partners with local conservation organizations in our Solar For Conservation program, where our customers can donate 1% of the total cost of their installation to a participating conservation organization of their choice. We will increase the donation to 2% for anyone who ultimately becomes a customer through this event! OnSite Energy becomes a Tesla Certified Installer!